Andrea and Chris Mullineux who have established an exceptional reputation working with Swartland vineyards have been working on a new project with Indian businessman Analjit Singh for the past few years, grapes sourced from across the Cape. 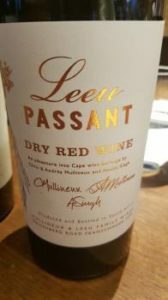 The first of these wines from the 2015 vintage and carrying the Leeu Passant label have now been released. Matured for 12 months in 228-litre barrels, 30% new. The nose shows some reduction as well as a delicate floral note, pear, green apple and citrus plus a hint of vanilla. Pure fruit, fresh acidity and a pithy finish – appears light notwithstanding an alcohol of 14%, the oak very well integrated. Matured for 12 months in 228-litre barrels, 30% new. A dramatic yet beautifully poised wine. Citrus blossom, lemon and orange plus spice on the nose. Huge fruit concentration and driving acidity (total acidity is an astounding 8.1 g/l). Layers and layers of flavour. 36% Cabernet Sauvignon, 33% Cabernet Franc, 31% Cinsaut. The first two varieties from Stellenbosch, the latter jointly from a Wellington vineyard planted in 1900 and a Franschhoek vineyard planted in the 1930s. Matured for 18 months in a combination of 225-litre and 500-litre barrels, 25% new. An enticing nose of violets, musk, fresh herbs, cherries, red currant and plums plus earth and spice. Pure fruit, fresh acidity and super-fine yet still appropriately grippy tannins, the finish long and bone-dry. Super-sophisticated – carefully crafted yet still possessing a certain sense of playfulness. An effort to express SA reds of yesteryear to best effect, to quote Andrea Mullineux.